Below I’ll highlight a few points that will not only give you more spin but a better understanding of what it takes to make your serve consistent and harder to return. But first… why do you need spin on your serve? The more rotation your outgoing ball has the more air pressure is created on top of it which pushes it down. This allows you to swing harder and higher knowing that the ball will come into the court due to the spin effect. Your ball’s rotation also makes it more difficult for your opponents to control their return. – I’ve always pictured the ball as the face of a clock (see graphic). In this case, to impart the slice on my serve I should swing at the back of the ball from just above 8 o’clock towards under 2 o’clock. That will send my ball spinning more sideways and as a result it will stay low right after the bounce. – To be able to brush for slice you should toss the ball slightly more towards your dominant side (right if you are right handed). This should allow you to swing up and away from you. – If the ball would be seen as the face of a clock, to hit a kick serve you should swing from 7 toward 1 o’clock on the back of it. The result will be a ball rotating almost like a wheel as it travels through the air. – For brushing the back of the ball in a low to high trajectory the server must toss it just over the head and slightly above the non-dominant shoulder. 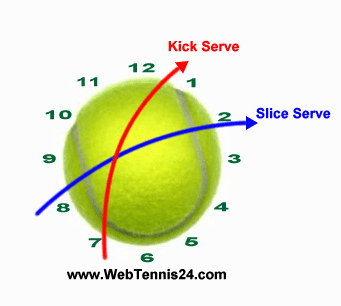 The toss for the kick serve is higher than the one of a slice serve. It gives the player more time to bend the knees and push up into the ball which is hit on the downfall. The slice is great for pushing the returner wide (if hit close to the side line on the deuce side) or jam the player (make it curve into the body). It is also good for serve-and-volley because the low bounce of the slice serve will prevent the returner from hitting down at the approaching player’s feet. The kick serve can be effective on clay courts, attacking opponent’s weak wing or pulling the player wide on the ad side (if the server is a right hander – opposite should be for left handed players). Some serve-and-volley players use the kick to give them more time to get up to the net but it should be used with caution because the high bounce of it can allow the returner to hit it back short at approaching player’s feet. Use the picture of a clock when practicing your serves to create great spin effects and make it more difficult for your opponents to return your serves. For in-depth analysis of how to strategically use the slice and kick serves… click here.